and also of English Youth and any others.' "
"William Legge, 2nd Earl of Dartmouth. Born 20 June 1731, died 15 July 1810 Blackheath Kent. British philanthropist and statesman who played a significant role in the events leading to the American War of Independence. He was educated at Westminster School and Trinity College Oxford. He succeeded his grandfather as Earl of Dartmouth in 1750, and took his seat in the House of Lords in May 1754. He became First Lord of Trade in the administration of the Marquess of Rockingham, and a member of the Privy Council in July 1765. In 1772 he became Secretary of State for the Colonies in the ministry of his half-brother Lord North. Faced with mounting hostility in the Colonies, he recognised Benjamin Franklin as colonial agent, and adopted a policy of delay to allow tensions to abate. When this policy failed he sought moderate measures to secure colonial dependence on Britain, but rejected the proposals of the Continental Congress. 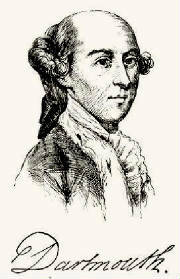 "He took much interest in education in the colonies, and was a subscriber to the fund that was collected in England by Sampson Occum, a young Mohican Indian, for the benefit of the indian charity school that had been planned by Occum, and partially endowed by Joshua Moor, in Lebanon, Connecticut (See WHEELOCK, ELEAZAR) Lord Dartmouth became president of the trustees of this fund, and when, in 1769, the institution was chartered as a college and removed to Hanover, New Hampshire, it was given the name of its patron, although, with his fellow trustees, he opposed the change. As a result of this opposition, the charity school obtained an independent charter, and remained distinct from the college till 1849. Lord Dartmouth was secretary of state for the colonies from 1770 till 1775." 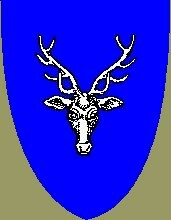 ARMS: Azure (blue) a buck's head cabossed argent (metal silver represented by white). CREST: Out of a ducal (pertaining to a duke) coronet or (gold), a plume of five ostrich feathers, three argent (white)two azure (blue). 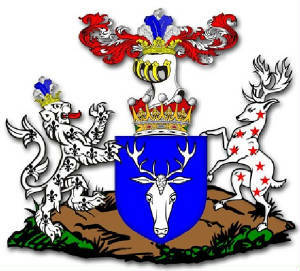 SUPPORTERS: Dexter (right), a lion argent(white) semée-de-lis sable (black) ducally crowned or, issuing thereout five ostrich feathers, as in the crest; sinister (left), a buck argent (white) semée of mullets gules (red).